The community of Murnau is a picturesque little town located in the foothills of the Bavarian Alps, approximately 70 km south of Munich. The municipality of Murnau with appr. 12,500 inhabitants is located at a subalpine altitude of 700 meters above sea level, overlooking the nature reserve „Murnauer Moos“ and the three warmest lakes of Upper Bavaria. The pleasant pedestrian zone of Murnau was designed by the famous architect of the Art Nouveau area, Emanuel von Seidl, who created facades that are today protected as landmarks. Cozy alleys and historic storefronts with traditional fresco painting invite you to take a stroll and go shopping. Small restaurants, cafés and boutiques characterize the village. And still, living in Murnau does not mean to do without modern infrastructure. The town offers everything from shopping, to schools, doctors, excellent cuisine, an active culture and event center hosting concerts, theater, meetings, conferences and expositions. Lake Staffelsee is the perfect recreation area offering numerous kilometers for walking and biking. Further advantages of Murnau include the perfect location in terms of infrastructure. 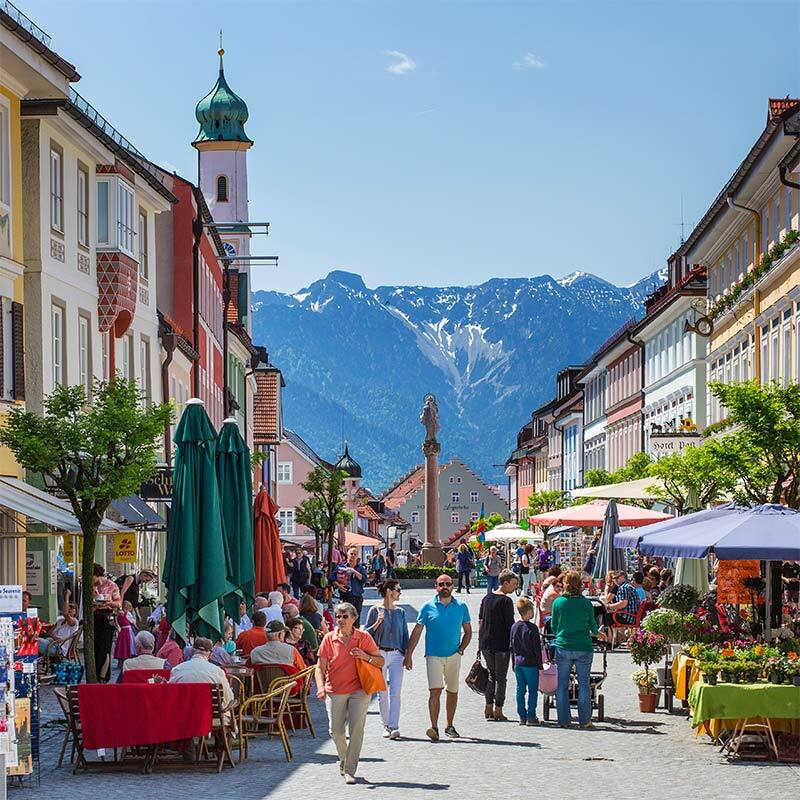 Located in the heart of Upper Bavaria it is close to the highway exit Munich – Garmisch-Partenkirchen and easily accessible by train via the route Munich – Innsbruck. City Suites Murnau offer ideal accommodation both for family and visitors to the reputable Murnau Trauma Clinic renowned in particular for hip and knee implants. We are also the perfect choice for culture and nature friends and vacationers of the town Murnau who enjoy a combination of modern lifestyle and traditional flair in a central location.